We've heard this so often. It is said by English teachers to their hopeful students. Aspiring writers bandy it about to encourage each other. Editors quote it to crush some dreams, while making others come true. 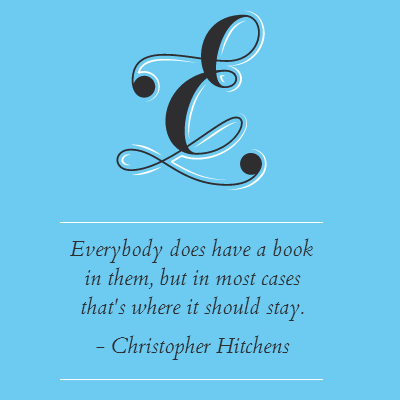 I mean, even The Hitch had something to say about it! Everybody does have a story inside them, their own secret little world that they carry around in their head. But whether or not it deserves to be told is a whole other question. Another stumbling block is whether people will bother reading it at all. The toughest hurdle of all - will they like it? Of course I want to write a book someday, preferably a novel. But what should I write about? This question has haunted me for a long time. I have so many stories to tell, so many opinions of my own that it is difficult to pin down just one topic on which I could write. On the other hand, I'm also not sure I have a novel-length story to tell inside me. Then it hit me: my own blog was the answer! When I started blogging way back in 2009, I just wanted an outlet to express my creativity. I'd always been an avid reader - about which I have written many, many posts - and naturally, I wanted to add my own voice to the ongoing deluge of words. I slowly realized that the purpose of my blog has changed considerably since then. It's still a creative outlet but it's also where I practice the art of writing. Where I post my opinions and the hundreds of little stories I have in my head. I've even started writing short fiction, finally. 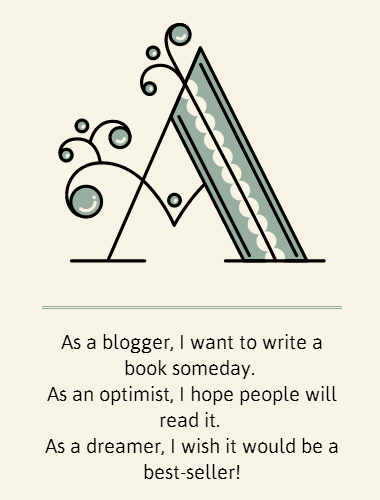 I'm already a writer (thanks to my blog), I just need to become a published author! But coming back to the topic of my future book, I do know that I'd never write a book that I personally wouldn't want to read. So that precludes any non-fiction, travelogues or self-help sort of books. A science-fiction space opera or murder mystery, maybe. But my dearest wish is to write something along the lines of Wodehouse, Terry Pratchett and Douglas Adams. A book that will make people laugh, make them happy. And maybe one day, I will. As a blogger, I want to write a book someday. As an optimist, I hope a few people will read it. As a dreamer, I wish it would be a best-seller! Truly we do and I'm glad we live in an age where if not a book, at least we have blogs as a literary vehicle! Thank you for stopping by and the compliment :D I really appreciate both! Well written :) All the best!